Deborah Chester is a tenured professor at The University of Oklahoma’s College of Journalism. She writes science fiction under the names Jay D. Blakeney and Sean Dalton and she writes regency romances under her own name. You can read more about her writing at Deborah Chester’s website. 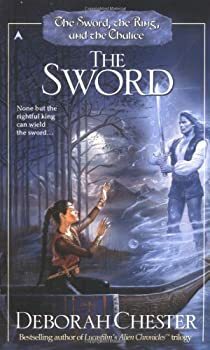 The Sword is the first of a high-fantasy trilogy and is little more than a prologue for whatever follows. What I mean by that is this: in terms of actual plot development, very little happens here. Each paperback in this trilogy is about 400 pages long (1200 total), so this could easily have been a 2-book saga with little to no impact on its quality. As for the story itself... There are some books you can read when you're tired, some you can't, and some that just make you tired. At its best, this book falls into the first category; at its worst, in the third. The writing is clear but rough and unremarkable — much more telling than showing, especially where character emotions are concerned, and not one clever simile or metaphor. The Ruby Throne — (1996-1997, 2007) The first three books are the original trilogy. The Pearls is a newer novel that continues the story of the same characters. Publisher: For over nine hundred years, the Emperor Kostimon has sat upon the Ruby Throne. He bargained with the dark gods for his immortality-and now he and his kingdom will have to pay the price. The Alien Chronicles — (1997-1999) Publisher: The ruler of the reptilian Viis has just purchased a new pet for his daughter. But he is unaware that this furred creature with sharp teeth–enslaved by the Viis for many years–is destined to bring down a corrupt empire. The Pearls and the Crown — (2007-2008) This series is related to The Ruby Throne trilogy. Publisher: Lady Lea-beloved sister of the Emperor Caelan-is gifted with the ability to see into others’ hearts and when she is moved to tears, those tears become pearls. When the hardened warrior Lord Shadrael kidnaps her and takes her through the fearsome Hidden Ways of the shadow world, Lea can foresee her destiny in him. For if she is to save Shadrael from his own darkness, she will ultimately have to choose between her brother and her abductor.